In my previous posts, I sounded excited about getting a lot of snow…. well I thought we had a lot of snow at that time. It’s nothing compared to what we recieved this weekend. Friday’s snowstorm landed the biggest single-day’s worth of snow that any of us have ever seen. In the evening, when the weather began to taper, Greg Roberts and Scott Noblitt, with the help of the owner of the very cool lodge they are staying at up here in the backcountry, were able to access the site via snowmobile to ensure that none of our equipment was damaged by the unreliable electric service during the storm. When Jack, Jessie, and I arrived in the morning, we were greeted with more than 3.5 feet of new snow (on top of the 1 foot we had remaining from the previous storm). If you have trouble grasping how much this really is… trust me, I’m still trying and I’m in the middle of it… here’s a picture of Jessie (about 5′ 5″ tall) clearing snow off to top of NOAA’s box trailer. Remember, all of that fell in ONE DAY. 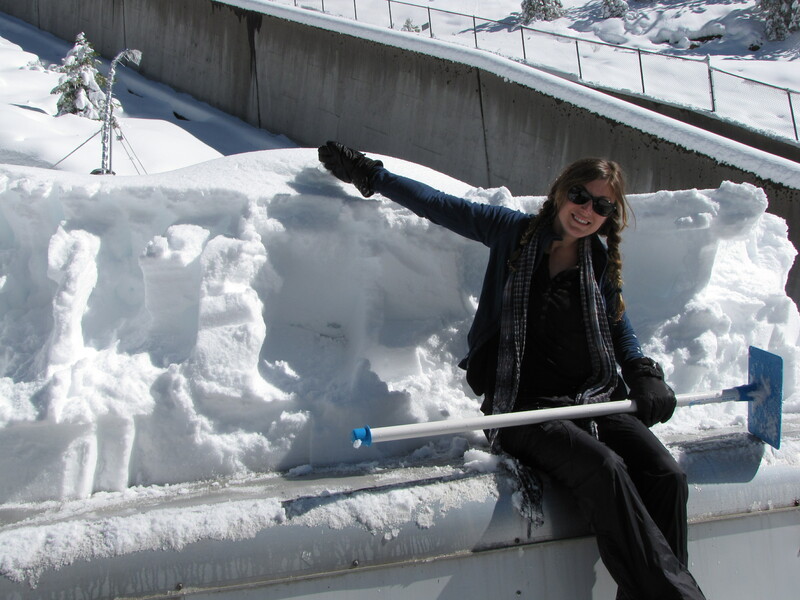 Jessie Creamean posing for a photo while clearing snow from the top of the NOAA trailer at Sugar Pine Dam after the storm on 2/25/11. According to meteorological data, this past storm may have been associated with Atmospheric River conditions, a notion that jives well with the heavy precipitation we received here in the Sierra in a short amount of time. These kinds of conditions, where water vapor is transported directly from the tropics to the western margin of North America, have been responsible for some of the heaviest rain and snowfall on record for this region. The band of water vapor that hit the coast here on Friday moved southward to the San Diego area on Saturday, giving our friends back home a good soaking. In terms of aerosol science, it was great to have this second storm a week after the first one: we collected some great snow samples and were able to look for reproducible conditions surrounding the two storms. We’re collecting lots of nice data up here, and we’re all confident that we’ll learn a lot from our observations thus far. We’re just about 10 days or so from the end of the intensive sampling campaign. We’re looking to finish strong… I got word today that there are plans to do lots of flights over Sugar Pine Dam in the G1. I still haven’t had the opportunity to spot them by eye over the site (every time I’ve been available to look, it’s been cloudy). Today is our first hard down day for the aircraft. This means no flights and no power to the aircraft so no one is allowed to work. It is a much needed break for the scientists who have been working so hard to prepare and start Calwater. It was a good day to use for a down day as we sit and wait for the clouds to come to us…the weather is almost unbelievable. Even the marine stratocumulus clouds remain in a stand-off with the coast. One can see this, as well as the CalWater study area highlighted in yellow in this cloud image. Just heard in our NOAA weather webcast this morning that the storm we were hoping for over this coming weekend just died out over the Pacific. We’re back to hoping for a Valentine’s Day storm. Honestly, I never thought I would be wishing so hard to see even a single cloud in the sky. I watch the NASA Satellite images almost every waking hour. I didn’t think it was physically possible to not have a single (non-cirrus) cloud over the entire Northern CA region during February, a month that historically has large amounts of precipitation. So, now I am learning how to run and interpret models that will be used to predict when the clouds will arrive in California–in particular, we are interested in the formation of orographic wave clouds over the Sierras. We need every possible tool so we can take advantage of flights over the next few weeks of the study…. OK, since we can’t talk about clouds, let’s talk about my second favorite subject…FOOD. We had our best “dining experience” yesterday in Sacramento. Prof. Daniel Rosenfeld, aka “Cloud God”, my friend and colleague who is here from Israel working on the study with us, was becoming skeptical that there is no such thing as a “good burger”. So, after doing some research, I found a place to take him for lunch. 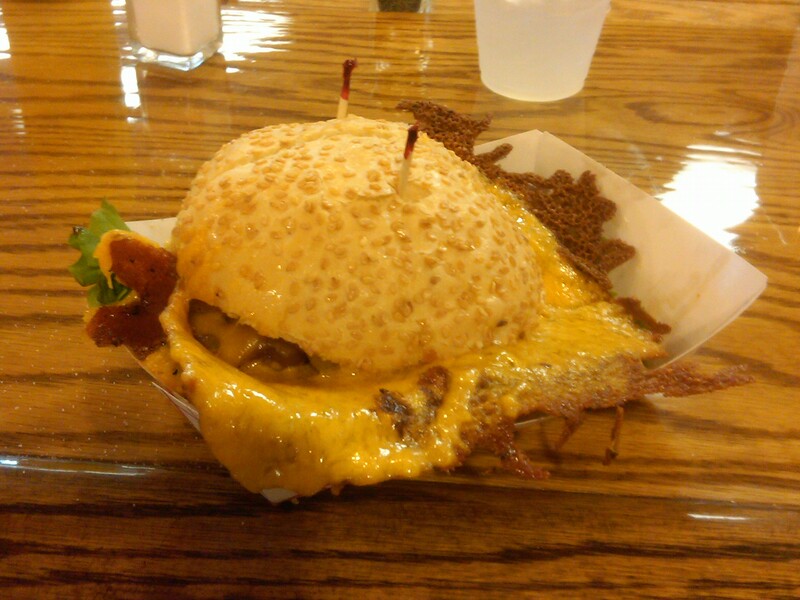 I told Danny, “If you don’t like this burger, then you can deem all burgers as bad, but let’s try one more time.”. So we went off to The Squeeze Inn in Roseville which is very near Sacramento. This place was highlighted by Diners, Drive-Ins, and Dives and I trust Guy’s judgement since he comes from my home town, Santa Rosa. We went in to a very busy restaurant and had to wait in line for about 15 minutes to place our order and another 20 minutes to get our food…so the anticipation and hunger were building. We sat at the bar to get a taste of the full ambiance–you can watch the owners cook the burgers….It became clear that you MUST get a cheeseburger or you’re missing a key part of the experience. They put down the burgers in a row and then place grilled onions or whatever toppings you order on them and then they put mounds of shredded sharp cheese that spills across the entire grill and melts all down and around the burgers. The cheese browns and bubbles while they cover the burgers and cook them. They then put the burgers and cooked crunchy cheese (on the edges) on a bun with fresh pickles, etc. and serve it up. It was so beautiful I had to take a picture. Welcome to the Prather Research Group‘s ATOFMS Field Notebook! Currently, some of the members of the Prather Group are involved with the CalWater field measurement campaign… the third installment in three years. A collaboration with the National Oceanic and Atmospheric Administration (NOAA), the California Energy Commission (CEC) and several other institutions, this study intends to investigate the interplay of atmospheric aerosol particles with clouds and precipitation in California. Comprehensive descriptions can be found within the Prather Group’s website and the NOAA-hosted CalWater website. Briefly, the concept for this study is to bridge direct observations of the chemical and physical properties of atmospheric aerosol particles with measurements of the surrounding meteorology. Detailed chemical and physical measurements of atmospheric aerosols are currently being made at a remote site in Tahoe National Forest at the Sugar Pine Dam utilizing several techniques, including Aerosol Time-of-Flight Mass Spectrometry (ATOFMS). Starting February 2, measurements will be made via research aircraft, utilizing Pacific Northwest National Lab’s Gulfstream-1 (PNNL G-1) — stay tuned for more on this part of the study! NOAA meteorological measurements have been underway for several months, including a large network of several types of radars, rain gauges, raindrop size distributions, surface meteorological and hydrological sensors. Members of the Prather Research Group that are participating in this study will be updating this blog throughout the study. Stay tuned to learn more about our measurements!